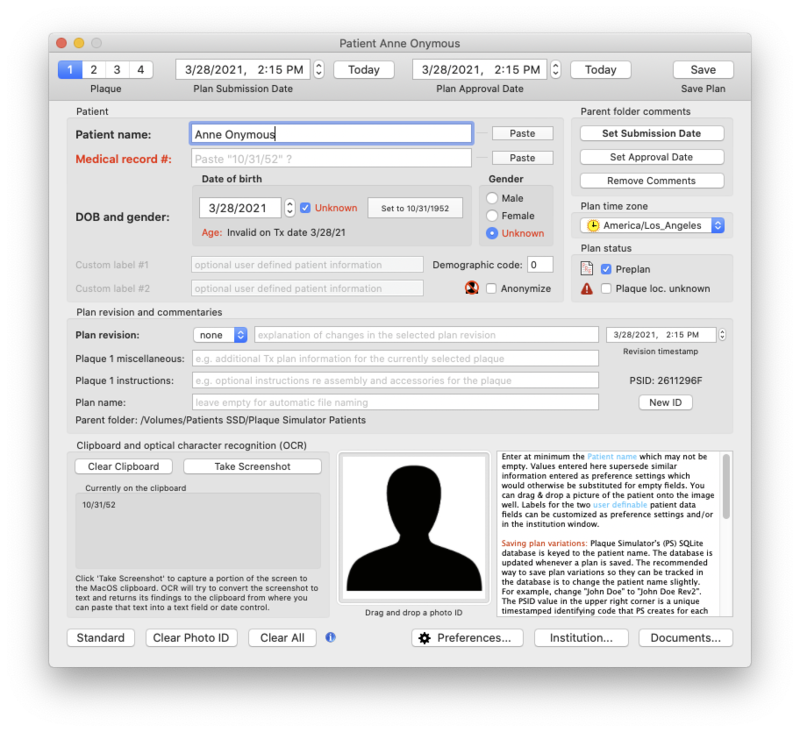 The Patient IDs window of the Plan Menu is where you enter the patient's name and other optional identifers. In the Patient group, enter at minimum the Patient name. This field must not be empty. For all other fields, values entered here supersede any available preference settings which would otherwise be substituted for empty fields. 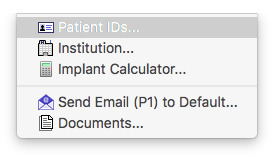 Labels for the two user definable fields can be saved as preference settings from the preferences users tab and can be superseded here for the current patient. You may optionally set plan submission and approval dates which are stored in the treatment plan file. Note: if you open an existing treatment plan and change these dates be sure to resave the plan in order to preserve the changes. In the Parent Folder Comments group you may optionally set the file system metadata comment of the parent folder of the treatment plan (.iplan6) file to indicate when a plan has been submitted and/or approved. You can display metadata comments in the MacOS Finder settings (e.g. control-click or right-mouse-button-click on the column headers when in Finder list view and enable comments display). You may optionally drag and drop a picture of the patient or eye onto the “eyedentity” image well control at the lower left corner of this window. This picture may optionally be included on the first page of the treatment plan document. Saving plan variations: Plaque Simulator's (PS) SQLite database is keyed to the patient name. The database is updated whenever a plan is saved. The recommended way to save plan variations so they can be tracked in the database is to change the patient name slightly. For example, change "John Doe" to "John Doe_Rev2". The Plan revision menu automates this for you. The PSID value in the upper right corner is a unique timestamped identifying code that PS creates for each new patient. This value can be used to search the database for entries associated with the same patient, even if there have been severe revisions to the patient name. It is recommended to allow PS to manage the PSID code. The Plan name field is empty by default for a new patient. The recommended action for users is to allow PS to manage the plan name. Patient plans are saved as "file packages" which are actually folders which appear to be files. PS will automatically generate a plan package based on the patient name. Plan packages end with the extension “.iplan6” which will be automatically appended for you. For example, if you enter the patient name "xxxxx", Plaque Simulator will automatically save the plan as a package named "xxxxx.iplan6". You can use the plan name field to save alternative plans for the same patient, but the database will always associate the most recently saved plan with each patient's name.